Parameter: (Color) Color of the shape. Parameter: (Point) Origin of the shape definition. Parameter: (bool) Whether the shape is inverted or not. Parameter: (bool) Whether the shape has antialiased edge. Parameter: (Blur::Type) The type of blur used for the feather. Parameter: (Real) Amount of feather of the shape. Parameter: (WindingStyle) How shape is rendered when crosses it self. References f, SET_INTERPOLATION_DEFAULTS, and SET_STATIC_DEFAULTS. 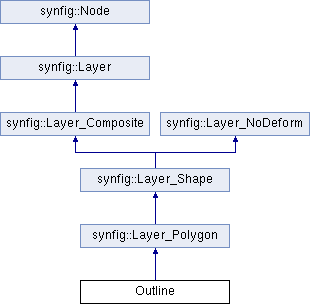 The Sync() function takes the values and creates a polygon to be rendered with the polygon layer. References bline, synfig::convert_bline_to_segment_list(), synfig::convert_bline_to_width_list(), CUSP_TANGENT_ADJUST, CUSP_THRESHOLD, EPSILON, synfig::error(), f, synfig::ValueBase::get_contained_type(), synfig::ValueBase::get_list(), synfig::ValueBase::get_list_of(), synfig::ValueBase::get_loop(), synfig::Vector::is_equal_to(), line_intersection(), synfig::Vector::mag(), N_, NO_LOOP_COOKIE, synfig::Vector::norm(), synfig::Vector::perp(), ROUND_END_FACTOR, SAMPLES, synfig::ValueBase::set_loop(), SPIKE_AMOUNT, synfig::type_bline_point, synfig::type_segment, synfig::warning(), and zero(). References synfig::ValueBase::get_type(), IMPORT_VALUE, IMPORT_VALUE_PLUS, synfig::type_list, and synfig::warning(). context Context iterator referring to next Layer.